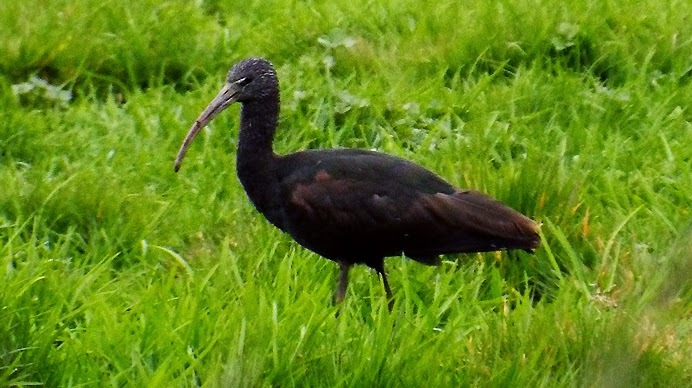 The Glossy Ibis is the only Ibis species which naturally occurs in the UK - it is an approximately mallard sized bird that arrives in this country as a vagrant, although increasingly so. It seems to settle in marshland and wet meadows where it probes the ground with its long curved beak. It is a cosmopolitan species, found on every continent but declining across Europe - apparently the British individuals are from Spain, one of the few places where the population is increasing. - A single vagrant bird seen at Lowdam seen in March 2014. GREY - UK Species yet to be seen. BLUE - Seen, but not photographed. PURPLE - Species heard only, no recording.